The UN estimates that women who cook meals in cooking huts inhale daily an amount of smoke equal to 10 to 20 packs of cigarettes. We were privileged to visit the home of this lady in Guatemala. The smoke in her cooking hut was so thick we were able to last only 1½ to 2 minutes before we needed to move outdoors to get fresh air. 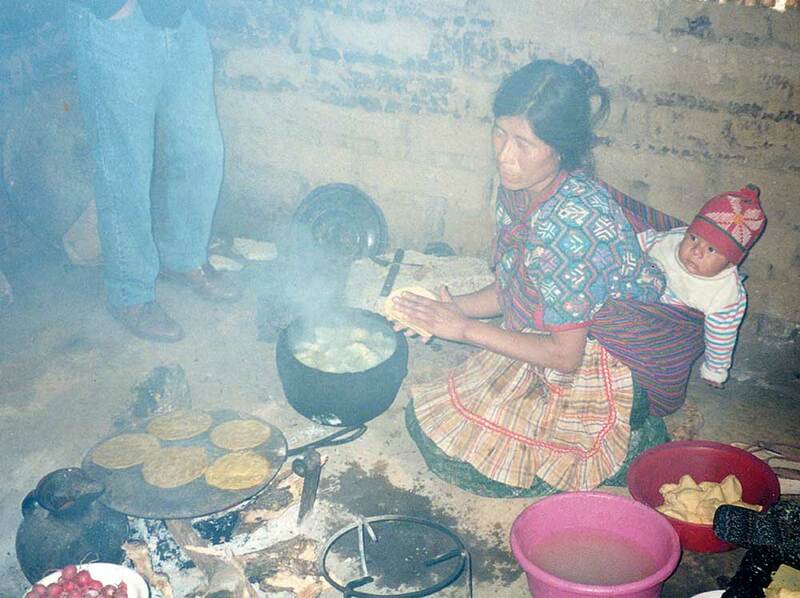 Lung, throat and eye diseases are prominent among women in developing countries due to the smoke of cooking fires. The small baby on her back and many others like him will suffer a smoker’s cough by the time they learn to walk. Dr. Ponce, a surgeon from Honduras, saw this picture and another picture of the outside of her cooking hut. The hut featured the use of bamboo on the top half of her hut to encourage ventilation. The top of the hut and top of the bamboo was charred coal black from the smoke. Dr. Ponce commented the most frequent surgery he does is on the lungs of women. When he cuts them open they should be a nice rosy pink on the inside. Because of the smoke of cooking fires, their lungs are as black on the inside as the charred bamboo. Proper chimneys and ventilation would help immensely. We wouldn’t dispute this. However, using solar ovens can reduce the need for cooking fires and the amount of trees cut for fuel. Solar is the cleanest, free fuel and is delivered free with no distribution problems to everyone’s door.